Stuttgart: taking your bike on the tram? No problem! While some trains allow bicycles and the occasional city bus will let you load your cycle, public transport systems often discourage bicycles from being brought on. I get it: they take up space, can be bulky or cumbersome to load, and take time. Besides we should be encouraging more people to hop on the bus or subway and not just fill it with bicycles. Still sometimes with hills or distances, even cyclists need a break! Leave it to the crafty Germans to find a new solution. 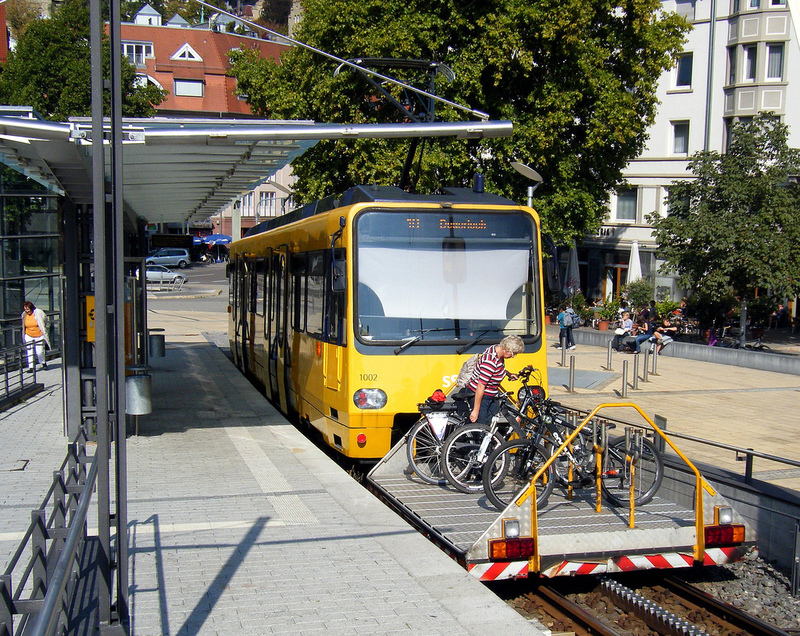 In Stuttgart, they found a way to link city trams and portable bike parking in one, smart! Absolutely fantastic idea. Stuttgart is surrounded by hills and the city center itself isn’t the nicest to make use of your cycle. Germans – or better Schwaben as they are known down there – have always been good at this type of technical or infrastructure solution. After all the motor vehicle has been invented there and built large scale..
Yeah, it’s a great idea! And thanks for the insights on the city & region’s specific geography. A good idea for other hilly cities facing similar challenges (or for the never-ending wind here in the Netherlands!) 🙂 I like the emphasis on mixed mobility management: cars, bikes, trams, trains for a more sustainable solution. What an amazing idea,I wish the city of Manchester would thing of something like that.